Excellent Workmanship: High Degree Of Agreement, Spreader Applies Precise, Consistent Pressure To Hold Work-piece Together For Gluing Or Assembly. Durable & Long Life-span: Made Of Ultra Fine High Speed Steel Materials, Wear, Break & Corrosion Resistant, With Long Life-span, Can Be Used For Many Times, Save Your Money. Humanized Design: The Handle & Trigger Perfect Fit With Your Hand, Release Stress From Any Direction. Comfort Your Hand, Support Long-time Used. The Limit Buckle To Prevent Tool From Dropping Down. Reduce Safety Accident. Widely Used: Extra Great For Gluing Or Assembly Project, Made For Carpentry, Cabinetry And Furniture Projects, For Many Types Of Woodworking Projects, Always Get The Job Done With Ease. Craftsmen Alike Will Appreciate The Versatility, Strength, And Ease Of Use The Clamps. 1. Long Press The Quick Grip Button, Directly Adjust The Spreader Capacity As You Want, Align The Arrows, Then Lock It. 2. Turn The Rotating Button To The Left Or Right Arrows, Press The Trigger And It Will Close Off Or Open Up. High Quality: Clamp Made Of High Speed Steel Materials, Wear, Break & Corrosion Resistant, With Long Life-span, Can Be Used For Many Times, Save Your Money. Portable Design: Jaw Covered With Rubber, Prevent Scratching of Work Surfaces, Great Friction, Avoid Work-piece Falling Down. The Handle Is Humanized Design, Even Long-time Used Can Protect You From Getting Hurt. 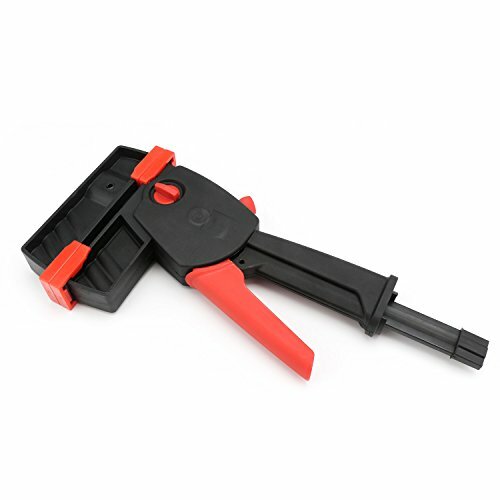 Wide Application: The Bar Clamp Always Get The Job Done With Ease. Suit For The Smallest Craft Project Or The Large Scale Cabinetry. Or Many Types Of Woodworking Projects. Extra Great For Gluing Or Assembly Project. Easy To Use: Two Ways To Adjust, Long Press The Quick Grip Button, Directly Adjust The Spreader Capacity As You Want, Align The Arrows, Then Lock It. Another Way Is, Turn The Rotating Button To The Left Or Right Arrows, Press The Trigger And It Will Close Off Or Open Up.